The Forest Management Guide for Boreal Landscapes (Boreal Landscape Guide) provides direction to planning teams to help them set the broad strategic direction for their forest management plan. Large, healthy, diverse and productive Crown forests and their associated ecological processes and biological diversity should be conserved. To provide for long term health and vigour of the forests, emulate natural disturbances and landscape patterns while minimizing adverse effects on plant life, animal life, water, soil, air and social and economic values. 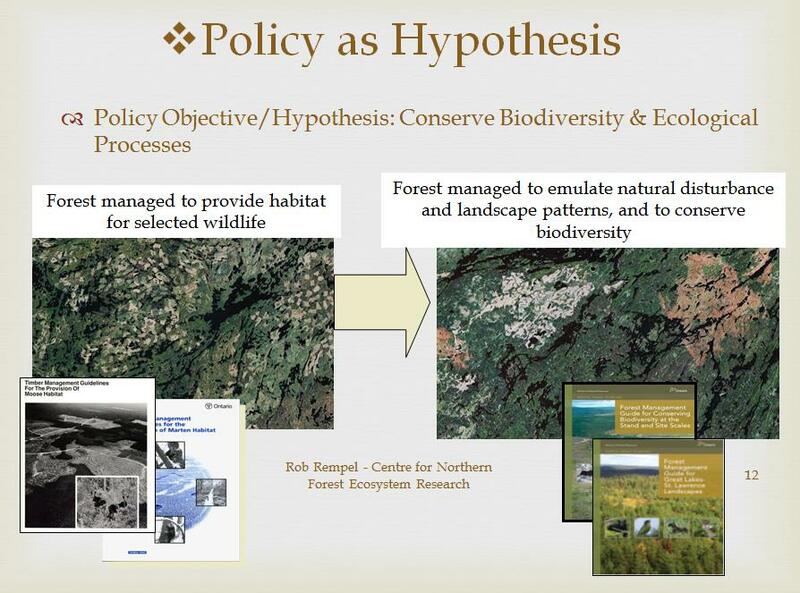 Emulation of Natural Disturbance should be viewed as a policy hypothesis, with effectiveness monitoring used to test assumptions and improve policy direction, in an adaptive management context. Here is the link to Ontario’s Forest Management Guides.